Wet cutting blade with 0.080" rim edge thickness for tile saws. Synthetic diamonds are carefully selected for hardness to give consistent blade performance. Cutting edge sintered on the blade body for safety. 2 percent cobalt in the matrix gives superior performance. 100 times life of conventional abrasive blades. Designed for cutting concrete, stone, brick, block and tile. 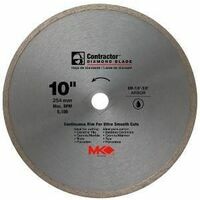 Wet and dry cutting blade with 0.080" rim edge thickness for tile saws. Synthetic diamonds are carefully selected for hardness to give consistent blade performance. Cutting edge sintered on the blade body for safety. 2 percent cobalt in the matrix gives superior performance. 100 times life of conventional abrasive blades. Designed for cutting concrete, stone, brick, block and tile.